Match Play 21 - The Blackjack Game With More Than Meets The Eye! 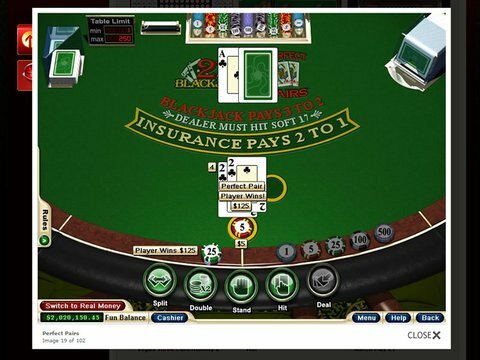 Match Play 21 is a variant of Blackjack and offers a compelling reason for those who like to play for free online. Firstly this is a game with six decks of cards with all the numbered ten cards removed. Does that mean the player has less chances of getting Blackjack? Well yes, it most certainly does, so may not be one for the purist, however how would an extra ten different ways to get paid appeal? That's what a player has with Match Play 21! The additional ten games' all evolve around reaching the target of 21, which everyone one's familiar with the standard game. Whenever the player gets Blackjack, i.e. he's dealt an Ace and a picture card totaling twenty one, he wins and is paid out at 3:2. Reaching 21 with the numbered cards however sometimes carries more favorable odds, as can be seen from the following. If a player draws 5 cards for their 21, the payout of 3:2 remains the same. Also with any 6-7-8 and any 7-7-7 the odds for these card combinations is also paid out at 3:2. Here's where it gets interesting. If the player makes their 21 with 6 cards they now get paid 2:1 odds. Also if they make up their 6-7-8 and 7-7-7 card combinations and they're all suited, their payout will be a minimum of 2:1. If the combinations are all in Spades, so much the better, as the player now gets to collect at 3:1! As well as being able to Surrender, Split and double as per normal, there's the opportunity to rake in the games speciality payout, 'Match Play 21', as the game's called. Get 3 suited 7's along with the Dealer's face up card a 7 too, and receive a whopping 40:1 payout!! Learn how to play RTG Match Play Twenty One today, Its Free at The WinPalace Casino!